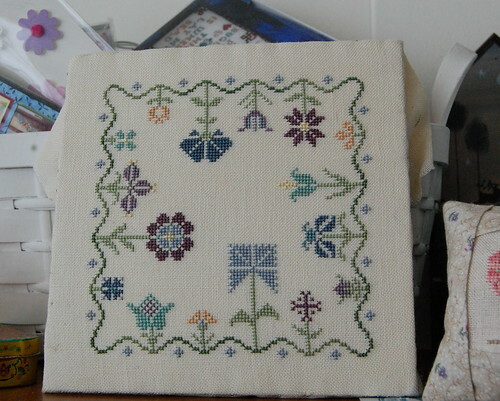 Nicole's Needlework: Daisy Sampler Finished! 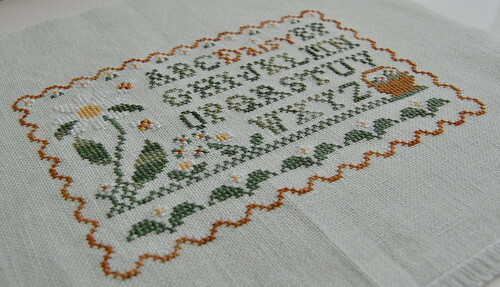 Country Cottage Needleworks "Daisy Sampler"
My mom found an old sampler I stitched for her. I kept asking her where it was and that I didn't care what she did with, but could I please just have it back. Thankfully she found it and it was not damaged! Oh, I am happy she found the sampler and you are going to frame it and keep it-I just love it! The daisy sampler is lovely. Congrats. I love the sampler you did for your Mom. I can't believe she doesn't really care for it-it's gorgeous. You stitch so fast! It's amazing. And I really like that sampler you stitched up for your mother! It needs to be out somewhere for others to admire. My mom has also 'hidden away' a couple of the gifts I've made for her over the years. LOL. Love the BN piece and I'm glad it's finally going to see the light of day. Your CCN piece came together SO fast - and it's lovely!! Both samplers are so sweet! Now that I've seen your Daisy Sampler, I think it has become a 'must-do' for me too. It's simply lovely. Yeah, me too. Daisy Sampler is a must do. Its gorgeous. Love the BN that you did for your Mom and sorry that she didn't like it. My mom hangs things I make that she doesn't like, in the bathroom. Ick. Any thoughts on how you might frame it? Have a great weekend, and just stitch between laundry loads, thats what I do. Yes you DO stitch fast! Great finish on Daisy, Nicole! It's lovely. Such a shame your sampler was hidden away. Glad you've got it back and you can do it justice now. I'm almost finished with Sonnenberg! I just put it down for a moment to check out some websites! How ironic! I find it beautiful also. I would love to see it once you have it framed! Daisy Sampler and Sonnenberg, 2 of my favourites, your 2 look so lovely. 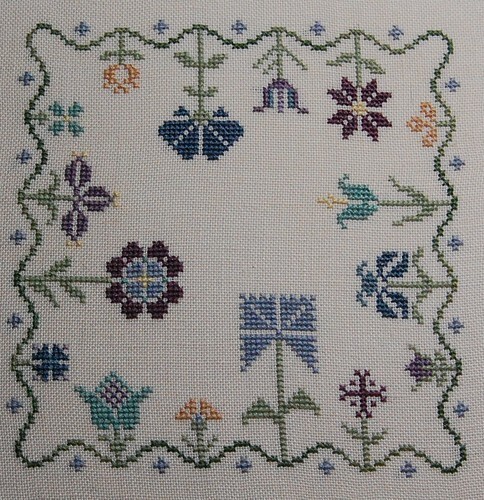 The daisy sampler is lovely - and I like the older sampler too! 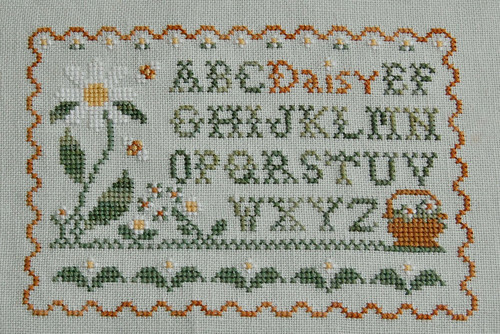 Daisy Sampler is lovely. I'm glad that te other sampler is not going to sit in a cupboard anymore. It should be out on display. Looking forward to seeing it framed. Your Daisy Sampler is darling. 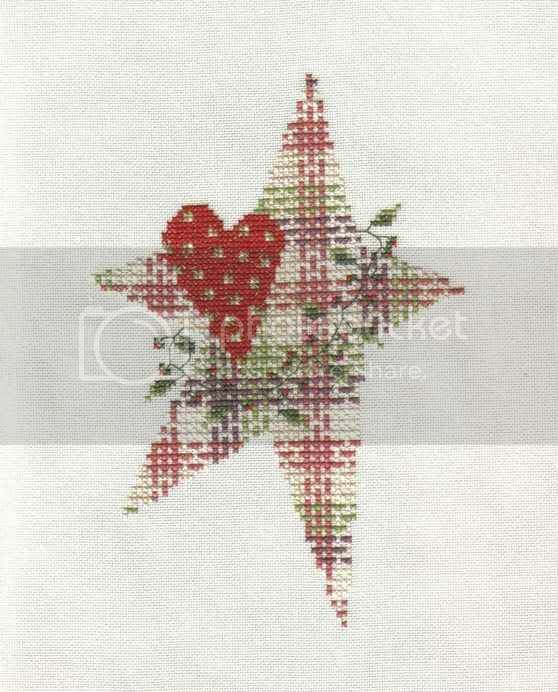 The piece you stitched for your Mom is sweet, too. Glad you have it back. Enjoy it! Daisy sampler is really sweet - I love it. I'm glad that your mom found your sampler. Yes, you should definitely have it framed. Congratulations on finishing "Daisy Sampler" - it's lovely. Congrats on the Daisy finish. I love your Brightneedle Sampler - glad you got it back and can reframe it! It's beautiful! Both pieces look wonderful. It will be neat to see your Brightneedle sampler framed.